Jefferson, TX an East Texas tourist town is already feeling a dramatic loss in business following a train derailment disaster involving the destruction of an overpass on Highway 59 at East Watson Street. A train derailment involving both Union Pacific and Kansas City Southern Railway Company is being investigated by DOT officials after 2 trains collided in Jefferson, TX, Friday morning on July 7, 2017. 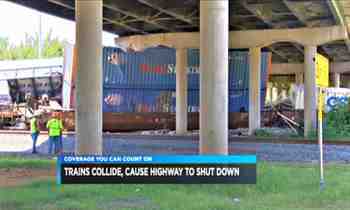 The collision occurred around 10:30 a.m. underneath the overpass on Highway 59 at East Watson Street on the north end of the city of Jefferson, TX. Although the Department of Transportation has not finished their investigation into the cause of the accident, Kansas City Southern Railway Company states that the incident occurred at a rail interlocker. A rail interlocker is a rail intersection where two train tracks meet in a perpendicular fashion and in some cases travel side-by-side with one another. As any motorist, consumer, or business owner can imagine the destruction of the overpass has severely impacted the U.S. Highway 59 and is causing monumental business losses to the historic tourist town. Union Pacific has issued an apology to the motoring public and the community for the incident’s impacts and promised to work diligently with all involved parties to remedy the situation. Miraculously, no physical injuries were reported according to KCSR, reporting station in East Texas. Jefferson police, Marion County Sheriff’s Department, a Marion County constable, and volunteer fire department were the first responders on the scene and are diligently working to safeguard the area and divert motorists. If you or a loved one were financially injured as a result of this train derailment disaster, please call the Testa Law Group for a free case evaluation at 877-780-9052.